Part of German-owned A-Rosa's 11-strong European fleet -- which stand out from the crowd with a trademark red pair of lips carrying a rose across the bow -- the 202-passenger A-Rosa Viva is one of the line's five "international" vessels. All of these ships have a dedicated English-speaking host to look after non-German passengers (although the majority of crew members throughout the ship are bilingual). Cruises sold to overseas passengers are on an all-inclusive basis, which covers an all-day open bar (excluding Champagne and a small number of premium brands), meals and snacks. 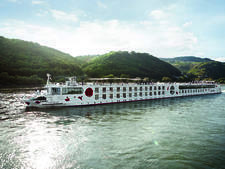 There is free travel for children under the age of 15, and the single supplement is waived on selected cruises along the Rhine, Main and Moselle. The 99 cabins, located on three passenger decks, also feature A-Rosa's signature red color, which is used in bathroom tiles, furnishings and the overhead bed canopy. To complete the theme, all passengers receive a red rose on arrival. All cabins measure 156 square feet and there are no suites. The only difference is that cabins on the lower deck have porthole windows and the remainder have French balconies with floor-to-ceiling windows. There are four twin-bedded cabins, with two single beds and a third pull-down bed fixed to the wall, which are suitable for families or groups of friends. All remaining cabins have beds that cannot be separated from a double bed configuration, although there are individual duvets for both sides. Unusual for a river vessel, almost all meals are buffet-style and passengers can eat what they want, and when they want during the generous dining times, which gives the restaurant a relaxed vibe. The buffet area is separate to the main dining room, and wine and drinks are served at the tables. One a la carte dinner with waiter service is included in the fare, which is given in a smaller, intimate dining area. Passengers who want a more formal dining experience for the rest of their cruise can opt to pay for other waiter-served meals available on selected nights. The menu features hearty German fare and regional specialities, with lighter and vegetarian options always available. In another break from most riverboats, the ship has a proper spa area (as opposed to a token massage bed in a cabin), which has its own reception area, two treatment rooms, gym, sauna, whirlpool and relaxation area. Other onboard facilities include a main lounge and bar, with a small stage and dance floor, and a horseshoe-shaped second bar in the smaller dining area, which extends into an outside seating area. The sun deck includes a large outdoor chess set, shuffleboard and small putting green. The ship does not have an elevator. A-Rosa caters to people who enjoy a bit of freedom and who don't mind that the voyage is not overly organized. At least one excursion is included in the price of the cruise and passengers can choose whether or not they want to buy others. The ship has bikes that are used for some guided excursions and available at other times for passengers to rent. 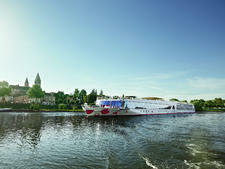 The 198-passenger A-ROSA Aqua offers one of the most inclusive river cruise experiences in Europe, including roundtrip air, gratuities, shore excursions and select beverages. 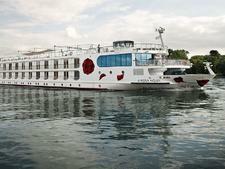 The 198-passenger A-ROSA Stella offers one of the most inclusive river cruise experiences in Europe, including roundtrip air, gratuities, shore excursions and select beverages. The 198-passenger A-ROSA Silva offers one of the most inclusive river cruise experiences in Europe, including roundtrip air, gratuities, shore excursions and select beverages. 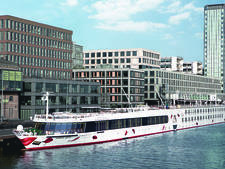 Offering a "casual-deluxe" environment, A-Rosa Brava boasts several unique features for river cruising, including a branded spa, a stage for entertainment and family-friendly cruises.